Let me start with a disclaimer: I am not in any way against Mom and Baby yoga. I completely support and encourage any activity that brings moms together in community, and if any of my mamas ask for it, I’m happy to direct them to a class. 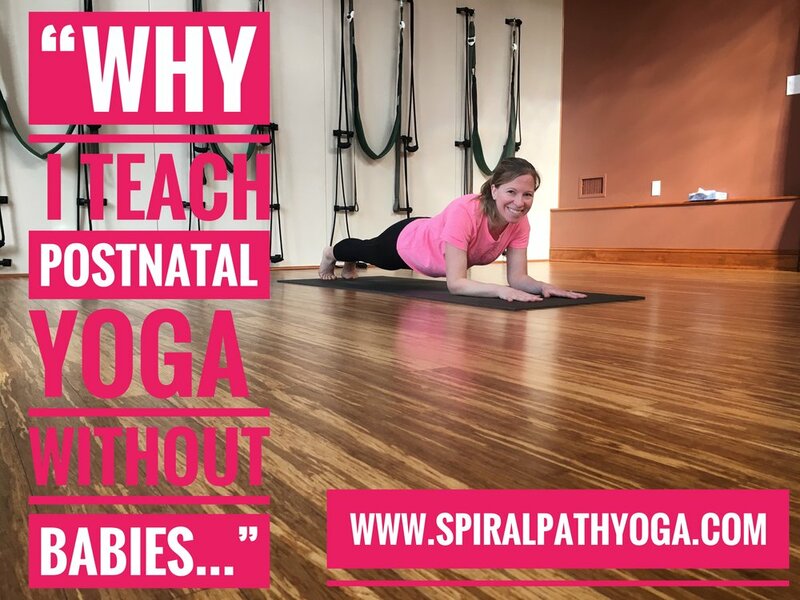 This post is simply about my thoughts and ideas on Spiral Path Postnatal Yoga. I firmly believe that after you have a baby, someone needs to take your baby for an hour so you can go to yoga- ALONE. Because even though you’re a mom, you are still a woman, and your body just did this amazing and miraculous thing….YOU MADE A PERSON! Regardless of how easy or difficult you felt your pregnancy was (as I type this I can hear my sister saying, “Whose pregnancy was easy?”), the fact of the matter is, you are working with a brand new body. Sometimes it’s hard to know where to start with that. I felt the need for a class which offers support and variations for however and whenever you show up ready to reclaim your practice. This might in be 6 or 8 weeks or it may be in 2 or 3 years. When I was in my early 20’s, I taught a postnatal class with babies. Even then my version of it was to teach a class for moms that they could bring their babies to, but the class was still simply about the moms. The babies mostly slept in their carriers or if someone needed to step out with one, nobody minded. If a baby was fussy, I would just hold the baby while I walked around teaching. More than a decade later, now in my mid-30’s with both of my businesses completely centered around caring for moms pre- and postpartum, I see even more of a need to focus on the mom. I feel like postpartum care is where as a society we are really dropping the ball. Women get all of this care and attention while pregnant, and then are sent home with a new baby and may not always have enough support in place. Teaching my postnatal class without babies is my way of giving women permission to do something just for them. An hour to yourself can go a long way, especially when you're adapting to a new baby; and as my mom always says, "Someone needs to mother the mother." One of my mamas recently told me that her husband noticed a positive shift when she took time to come back to class. My sister claims that we make her a better mom by giving her support and breaks. Having a baby is an incredible and all encompassing transformation and the transition to motherhood doesn’t end with birth. In a society where we expect moms to hop right back into life, work, relationships, and exercise routines, I want to send the message that hey- it might take a little while and you know what? It SHOULD. You should have space to adapt, to process, to regroup, to find out what being a mother really means for you. Our postnatal class gives moms that space, to simply be the women that they are, to re-acquaint themselves with their bodies, minds, and hearts, to have time to connect with other women, to be shown modifications and variations of postures, to be able to express their feelings without judgment, and to be supported physically, emotionally, and spiritually. Oh and also, I love being able to see my mamas between pregnancies! “You will know your baby better than anyone.” I’ve heard my mom say this countless times. She tells all mothers this, and she says it repeatedly. I started whining at my sister about 6 months ago. As soon as she mentioned the word, preschool. “I don’t understand why she has to go! She’s only turning three in July. Why can’t we wait until next year?" When that had no effect, “Well, then don’t sign her up on my days. 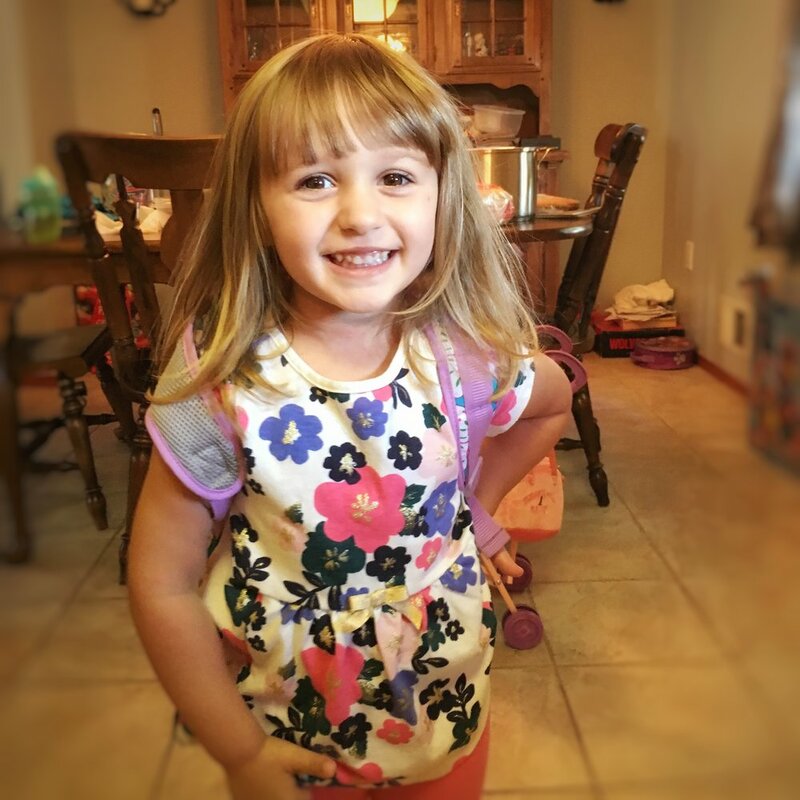 I don’t want to lose time with her.” I watch my niece and nephew two days a week during the school year. My mom does two days, and her mother in law takes the fifth day. Well, here’s the other side of family care. I just really didn’t want Kenzie to go to preschool. I LOVE my days with my niece and nephew, or as I usually call them, “My friends.” I didn’t want to miss a minute of it. So I was arguing with my sister about it, telling her that it was a dumb idea. What if Kenzie’s not ready? What if she doesn’t like it? My sister calmly, and then not so calmly repeatedly told me it was going to be good for her, she was definitely ready, and she would like it. She also wanted to know what was wrong with me because why wouldn't I want a break in the day? And you know what… She was right BECAUSE SHE’S THE MOM AND THE MOM ALWAYS KNOWS. Kenzie was totally ready. We debated between ballerinas and unicorn dresses, we talked about how she was going to have SOOO MUCH FUN, and we headed off. I was still very anxious. We walked in, and she got a little overwhelmed with all the people. She asked me three times if I was going to come back for her. Then we walked into her classroom, and her teacher greeted her warmly and told her she would have fun and make new friends. She gave me a big squeeze, asked again if I was coming back, and said, “Ok. Bye.” To my surprise, she didn’t cry. I didn’t either. So to all our mamas out there, remember this, “You will know your baby better than anyone.” Remember it when friends and family (even well meaning friends and family) give you their opinions on breastfeeding, on co-sleeping, and parenting choices. This is your baby. You will know. Trust your instincts. I took my first surf lesson, and I am hooked . . . like in LOVE! It’s a tiny bit ridiculous that I haven’t figured this out until now. I've always lived about 15 minutes from the beach and I spent my teen years competitively swimming. Oh, and did I mention that I'm completely obsessed with the ocean, and I'm convinced it can heal all things? Learning to surf has been on my wish list for about as long as I can remember. My friend, Kirsten, started a girls surf camp called Girls Wave Riding. When I saw this, I was really jealous of those kids, and jokingly asked her if I could come to camp. Luckily for me, she expanded and started offering surf lessons for women! Last week, I took my first lesson with Women in the Water, and it was amazing! I tried learning to surf a few times before this. Two of my guy friends took me out and tried to teach me, but sometimes I think you just need to hear it from a woman. Kirsten, the owner of both surf camps, is a phenomenal teacher! She makes learning to surf easy, accessible, and FUN; and she has the confidence and skill necessary to truly teach what she loves. She completely takes the intimidation factor out of it. Being out in the water with her early in the morning before the crowds hit the beach was pure magic. It was the happiest and most excited I’ve felt in a long time. For those of you who have been following along with me here, I’ve been talking about working my way through grief. I always compare deep grief to drowning in the ocean. When you’re grieving, for a long time, you can feel like you’re drowning. It’s dark, scary, and hard to breathe. Eventually you start to tread water and begin to swim. Then, a giant wave knocks you back down and you’re struggling to breathe again. The water settles, you tread water, start to swim, and then another wave. But at some point (hopefully), the waves become farther and farther apart until you are again swimming or moving through your life. Grief’s tricky and just like the ocean, you never really know when you’ll get knocked back by another wave. I took my surf lesson on my Nana’s first anniversary. I wanted to do something to shift my energy. I’ve been really struggling with her passing, and the awareness that I had completed an entire year of my life without her has been challenging for me. Something about taking this step, to learn to surf, like I’ve always wanted to do, really helped me. I’ve been living in anxiety about life moving too fast, and fear around death and the inevitability of it all; booking this lesson and beginning the process of learning a new skill really shifted something for me. It reminded me of how much I want to do and learn, and I feel less stuck. My lesson was a week ago, and it’s the first week I've made it a week without crying in the past year. While I think it’s easy to get stuck in our routines and in the business of day to day life, there’s always the opportunity to try something new, to find something else that lights us up. All it really takes is one step forward. When Kirsten and I were out in the water, I started thinking about how powerful learning to surf is, especially for young girls. When you surf, you’re waiting to catch the wave you want, and when you see it, you paddle for it and go after it as hard as you can. Sometimes you miss it. Sometimes you catch it and ride the wave in, maybe on your stomach, a bit hesitant at first; then you try to pop up to your knees, and finally you try to stand. Sometimes you fall, and sometimes you ride the wave all the way in. It feels like a perfect metaphor for really LIVING your life. You have to wait until you know what you want, and then you go after it with everything you’ve got. Sometimes you miss it completely, and then you wait a little while until the next opportunity presents itself and you try again. Sometimes you go for it and fall, maybe gently, or maybe you get completely rocked. Either way, if you’re really going for a goal, you’re probably going to fall a few times. Falling is important, it’s how we learn! You have to shake it off and try again. Then there are those times in life, where you catch your wave, you achieve your goal and it’s awesome, effortless, and you feel like you’re on top of the world. No matter how long the ride is, eventually the wave ends and you jump off and paddle back out and wait to make your next move, maybe feeling ready for a bigger challenge. I think it’s really important that as women we support each other and encourage each other to go for our goals. It’s ok if you fall, if you don’t make it the first time. It’s awesome really because it means you tried. It means you’re actively living your life, and the best part is, there’s always going to be another wave…. For those of you who read my post on Delusional Optimism, I am happy to report that my attempts to improve my time management skills are indeed working. By bringing my awareness to my slightly skewed concept of time and trying to hone in some better boundaries, I’ve been knocking things off my to do lists right and left #likeaboss. So, my question was this, “If I’m operating in a more organized way and accomplishing the things I set out to do, why do I still feel down and discouraged?” The answer came gently through one of my friends, “Katie, you’re still grieving.” And, that is true. I’ve been grieving for about two and a half years now. I lost one of my best friends 7 months before I got married, and about a year and a half later, I lost my Nana (who was really more like my second mother). My friend was sudden and unexpected. You aren’t supposed to lose your friends at 32. My Nana was almost 90, and while it wasn’t as shocking, it’s been incredibly hard. After my friend died, I thought I was going to drown in my grief. It was the hardest thing I’ve ever experienced, and I miss him every single day. When I lost my Nana, a part of me shut down and disconnected from it. I’ve never been without her, and the reality of it was actually terrifying to me. I kept saying that to people and nobody seemed to understand it. It wasn’t simply that I didn’t want to lose her; the idea of living without her scared me. After she died, I just started moving faster and faster. It’s really not that hard to over schedule your life. I have work that I love, a husband, friends, a sister with two kids who could always use a hand or two, and a dream house to work on. I’ve been taking on thing after thing until I started to feel so overwhelmed, I knew something had to change. Losing two of the people closest to me in less than two years has pushed me into this panicked battle with time. We really don’t know how much time we have to be here with the people we love. I think a certain awareness of this is helpful. It reminds you to appreciate your life and all of the little moments that make it up. Where I’m at though isn’t quite like that. I’m in this constant state of anxiety that I’m going to blink and it will all be over and I won’t have enough time to get everything done. I won’t have enough time to be with my loved ones or to create the things I need to create, or to travel to all of the places I want to go; so I’ve been hurrying, moving constantly, trying to get more than is humanly possible accomplished each day, and then beating myself up that I’m not doing a good enough job with any of it. I usually consider myself to be pretty self-aware, so I’m not sure why it’s taken me this long to see that I’ve been running from my grief, and it’s beginning to catch up with me. You can only run for so long before your body needs a break, and my grief is beginning to sneak through the cracks in my armor, leaving me crying in the middle of Stop and Shop or hearing myself sound impatient and frustrated when I don’t mean to be. I think it’s time to stop running. The other day, when we had a long list of “shoulds,” my husband and I tossed them all out the window to go to my parents house and play in the pool with my niece and nephew. It’s the first day I’ve felt at peace in a very long time. I think I need to accept that this is where I am right now, and there’s nothing I can do that will make me heal any quicker. I try to hold both Matt and my Nana close. Their memories fill my house, from Matt’s artwork to my Nana’s furniture, and they are with me in all of my moments. I think of Matt when I cut lemons; it always stressed him out because I move so fast. I think of my Nana when I pour laundry detergent because she would swirl the cup so none of it would spill down the side. When you love people so much, they become a part of you forever in ways both big and small. I’m going to try to be more patient with myself and my process, and accept the fact that I’m not really ok right now. I’m going to set the intention to create space to let the grief process out, and I’m hoping some of the panic will leave with it. That’s where the real yoga is, in being completely present in your process and experience. The standing on your head isn’t the hard part, it’s the sitting still. That’s where the real magic begins. I have come to the conclusion that about 80 percent of the stress in my life is self-induced. The negative emotion I experience most frequently is feeling overwhelmed. I take on too much, say yes when I should say no, and seriously lack organizational skills. I blame my mother. Seriously, I’m convinced the woman has super powers. She raised four kids, worked full time, and is the most amazing mom ever. When I was four, she was commuting back and forth to Columbia University to get her Masters in Midwifery, and she would study on the floor of the hallway so we could see her from our bedroom as we went to sleep. She currently works full time as The Director of Midwifery for an OB-GYN practice, takes care of her grandchildren, teaches prenatal yoga and childbirth classes, and still manages to train for and run marathons. She goes on vacations with my Dad and somewhere in their week away, she runs a marathon. She does this multiple times a year. When that's your role model, you pretty much think you should be able to take on the world and do anything. So, I set out to accomplish more than is realistically possible to do on any given day. My husband calls me a “beautiful disaster” because I’m constantly moving so fast that I have a tendency to walk into walls and break a lot of dishes. I always feel like I’m falling behind, like there are a million things on my to do list and I’m nowhere near getting them all done. Last year, I got hooked on the concept of minimalism. I started reading articles and blogs about how having less "stuff" can help you to have a more meaningful and joyful life! I was really excited about this because it made me think, “If I have less clutter in my house, my keys won't have such an easy time hiding from me.” So I decluttered a LOT. Then I decluttered some more. One of my favorite mantras has become, “When in doubt, throw it out,” and my house is definitely cleaner, but it didn’t actually solve any of my problems. I still find myself feeling overwhelmed, frustrated, and like I’m battling time most days. The reason I feel overwhelmed is because I don't set realistic goals or boundaries for my time. I literally set myself up to fail. I told a friend the other day that my goal for my one day off this week was to finish the photo gallery wall in my house, paint an end table, a bookshelf, my bathroom vanity, and dig up some bushes in the front yard. He just laughed and said, "Everything you just listed is a full day project on it’s own.” I do the same thing with my work schedule and my social life. I hate the feeling of disappointing people, so I have a hard time saying no. I say yes way too often until my life is completely over scheduled. Then I get frustrated when I'm exhausted, burnt out, and haven't accomplished half of what I set out to do. My goal for my 35th trip around the sun is to find more balance in all areas of my life, to say no when it's necessary, and to start taking an honest look at what is actually possible for me to do on any given day. Here’s my plan so far: I’ve started bullet journaling. If you haven’t heard of it, type it into “the google.” It’s pretty awesome, and it’s helping me recognize where my delusional optimism (in regards to only having 24 hours in a day) is holding me back. Speaking of those 24 hours, I’m also attempting to get onto a better sleep schedule. I’m fond of saying, “Sleeping is for sissies,” but I heard a rumor that getting adequate sleep actually increases your productivity. My sister SWEARS this to be true. Finally, I’m going to start being brutally honest with myself and everyone else in my life in regards to how I commit my time. My superhero mom says you have to accept that you’re never going to get it all done in a day and make peace with that . . . I”m working on it. Welcome to Spiral Path Yoga! We are a mother/daughter team inspired to celebrate the feminine and create community around motherhood. My mom, Karen, is a Certified Nurse Midwife and The Director of Midwifery for Ocean Gynecological and Obstetrical Associates. I am a Licensed Massage Therapist with a Certification in Prenatal and Perinatal Massage. We both teach yoga and we also offer childbirth, breastfeeding, and breathing for labor and birth workshops. My sister, Kendall, is the mother of a two and a half year old girl, Mackenzie, and an 8 month old boy, Robert. This blog is a place where we will share my mom’s knowledge and insight from her career of birthing over 3,000 babies, my tips and guides for wellness and balance, and my sister’s experiences as a mother. Our goal is to empower women through the transition into motherhood. Back when women lived, birthed, and mothered in community, birth was considered a natural part of life. In our busy, modern society, we’ve started to lose touch with this concept. In the year 2017, with all of our medical advancements and technology, we should have less fear around childbirth, but it seems that we have more. Birth is indeed a natural part of life, but our present day society sends the message that it is a medical condition to fear and instead of supporting one another, many women feel judged by others about their choices around breastfeeding or co-sleeping or overwhelmed with negative birth stories. Spiral Path is where we have created a community to give women a place to connect with other women, a place to feel supported and nurtured. We truly believe in the power of female connection. My mom, sister, and I function as a tightly knit unit and the link between the three of us is incredibly strong. It became even stronger when my sister became a mother; and I think having a female support system is an integral part of a healthy life. We wish to welcome you to our world, where we strive to encourage, educate, and support you through this beautiful transition into motherhood.